For the love of Zombies! Although having seen this film multiple times since it's initial viewing back in '09 I just found this zombie fest for 10 bucks brand new on Blu Ray at my local Target store...so I found a review was in order. For those that are fans of Amc's The Walking Dead and current members of Zombienation and have yet to see this film I have one question fer ya?... What are you waiting for? 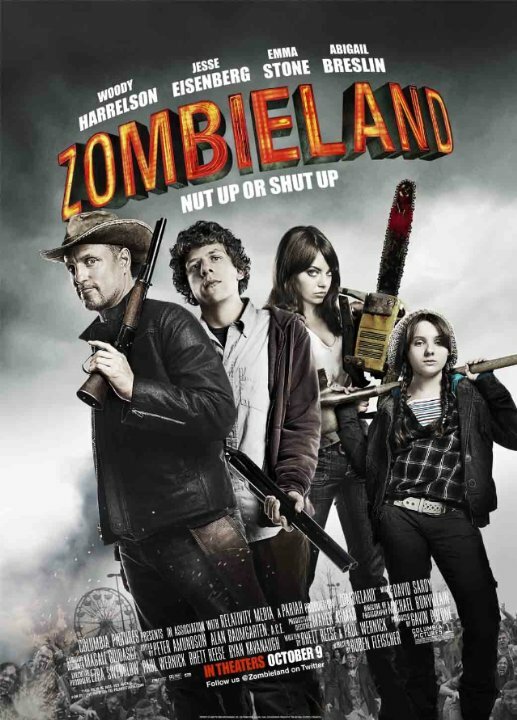 This movie backed with a pounding yet stellar soundtrack which opens with one of my favorite tracks by one of my favorite bands Metallica (For Whom The Bell Tolls) right away envelops into once again living life in a zombie apocalypse. This time the zombie mutant virus was brought along via The Mad Cow disease epidemic. Enter Columbus (Jesse Eisenberg) an unaffected College student who is trekking his way through the apocalypse from Austin, Texas to Columbus, Ohio to see if any of his family still remain amongst the living it's not long before he runs into yet another survivor in the form of Tallahassee (Woody Harrelson) who isn't much on people skills but has a great skill in zombie bashing. Tallahassee reluctantly allows Columbus to tag along with him in his Cadillac Escalade complete with an attached snow plow on front (Great for plowing through zombie hoards!!) Tallahassee also explains to Columbus that he had a pet dog who died and he also has been searching for his other love...Hostess Twinkies. It's not long before the pair meet up with Wichita (Emma Stone) and her lil sis Little Rock (Abigail Breslin) (Notice all the characters are named after cities throughout the u.s.?) two sisters who delve in the art of con artistry and it's not long before they also con both of the boys from Tallahassee's prized Escalade. They haven't seen the last of these girls as further down the line they rejoin forces and go on to Pacific Playland an amusement park known from the sister's youth and to be supposedly free of zombies. I like these new horror/comedy genre themed movies and plan on watching as many as I can once they are completed...a gem of a film!